Howard Computers gets you connected with hi-tech computers and accessories, from desktop computers and laptops to peripherals, printers, monitors and more. Computers and accessories - Howard Computers puts the latest technology within your reach with an impressive range of computers and accessories, from brand name notebook computers to custom desktop computers and laptops, you'll find the computer system that is right for you and all of the state-of-the-art extras that go along with it including computer software, hardware, peripherals, networking solutions and more. Desktop computers and laptops - From cutting edge touch screen functions to amazing gaming capabilities, Howard Computers allows you to customize your desktop computers and laptops to fit your every need. You'll also find notebook computers, servers and PDA's from popular brands like Acer, Lenovo and Howard computer systems that are designed, assembled, and made with the highest quality, name-brand components and computer accessories that are thoroughly tested in-house for compatibility, performance and total reliability. computers and peripherals - Get plugged in with the latest desktop computers and peripherals that will make your life online even easier with a selection that includes quality keyboards and mice, pointing devices, image scanners, external hard drives, cameras and camcorders and other breakthrough computer accessories that will expand your machine's capabilities tenfold. Computers and printers, monitors and hardware - When it comes to desktop computers and accessories, monitors and printers are must-have accessories that top any list. Shop for computers and printers from HP and Lexmark, sharp LCD display monitors and more essential computer hardware including motherboards, processors, memory, projectors, casings and even more technologically advanced computer related accessories featured at Howard Computers. 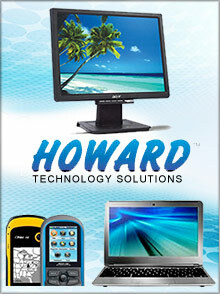 When you invest in computers and accessories from Howard Computers, you are investing in products that will not only meet your expectations, but in most cases exceed them. Design your own custom computers and laptops down to the last gig of memory and find hundreds of products and solutions that will keep your computers up to date and running smoothly. Plus, Howard Computers is hardwired to bring you exceptional customer service, providing free technical support 24/7, 365 days a year for as long as you own your Howard product. Apply to have your company listed? Introducing... the world's first dynamic catalog, designed by YOU! Apply to have your Company listed.